President Muhammadu Buhari will undertake a four-day trip to the United Kingdom to see his doctor, Garba Shehu, Senior Special Assistant to the President on Media and Publicity, has confirmed. Shehu also confirmed that in the course of the "technical stopover for aircraft maintenance in London on his way back from Washington last week" the President had a meeting with his doctor. "The doctor requested the President to return for a meeting which he agreed to do," he said. "President Buhari will return on Saturday, May 12th. 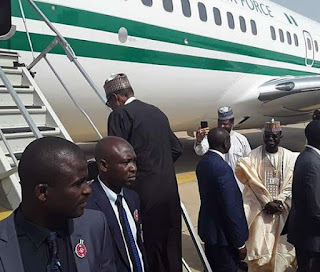 On his return, the President’s two-day State Visit to Jigawa, which was postponed because of the All Progressives Congress, APC’s Ward Congresses, will now take place on Monday 14th and Tuesday 15th May." After Buhari left the US on Tuesday but still hadn't arrived Nigeria by Thursday afternoon, it was thought that all was not well with the President. However, Shehu explained the two-day delay by saying the President made a "technical stopover" in the UK. Although Buhari was away in the UK for 103 of the 365 days in 2017, his aides relentlessly defended his health, Femi Adesina, his Special Adviser on Media and Publicity, once saying he was "as fitas fiddle". But when Buhari returned to Nigeria, he admitted that he had "never been that sick before" since he was a kid.